~Adonai, make haste to help me! If we have died with Christ, we shall also live with him. while the hungry are finally full. while the mother or many languishes. casts down to Sheol and raises up again. and to make them a glorious throne. who set the world upon them. while the wicked refuse to walk in light. the enemies of Love run towards self-destruction. Adonai judges the ends of the earth. and exalt the horn of the Anointed. Christ did not enter into a sanctuary made by hands, a copy of the true one, but heaven itself, that he might now appear before God on our behalf. 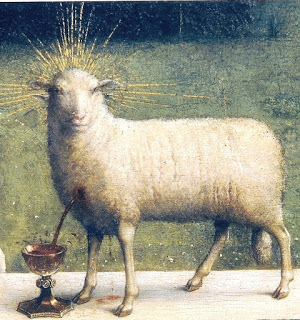 Not that he might offer himself repeatedly, as the high priest enters each year into the sanctuary with blood that is not his own; if that were so, he would have had to suffer repeatedly from the foundation of the world. But now once for all he has appeared at the end of the ages to take away sin by his sacrifice. Just as it is appointed that human beings die once, and after this the judgment,so also Christ, offered once to take away the sins of many, will appear a second time, not to take away sin but to bring salvation to those who eagerly await him. R. Christ has entered the sanctuary once and for all, *he has won for us an eternal redemption. V. He entered, not with the blood of goats and calves, but with his own blood; *he has won for us an eternal redemption. V. Glory to the Abba and the Word and the Holy Breath of Love. he shares fully in our weakness, except that he never sinned. You shared your life, your love, your bread and your dreams with Judas, while knowing he would betray you; ~bless us with unconditional love for all people, including those who hurt or betray us. Your disciples followed a man carrying a water jar (Luke 22:10) to the house where you would celebrate Passover ~ bless all those who carry water, those who offer hospitality to others, and those who work to prepare for the feasts. You celebrated Passover with your disciples, re-living the Exodus of your people from slavery in Egypt; ~ bless our Jewish sisters and brothers who are celebrating Passover and help us work together Jews, Christians and Muslims, to end all forms of slavery and oppression. ~ lead us on the way that leads through dying to all that is untrue and unnecessary to freedom and the fullness of life.